Henry Threadgill, a saxophonist and flutist known as one of the most original composers influenced by jazz, has been awarded the 2016 Pulitzer Prize for Music for his recording In for a Penny, In for a Pound. The jury described the piece as a "highly original work, in which notated music and improvisation mesh in a sonic tapestry that seems the very expression of modern American life." The recording was released as a 2-CD collection on Pi Recordings in 2015, and was listed among the Top 10 albums of the year in the NPR Music Jazz Critics Poll. The Pulitzer Prize is an award that historically has celebrated compositions in the classical style. But your work blends a lot of improvisation with pre-defined composition. I wonder how you see the difference between those two, improvisation and composition. Improvisation is a part of what I do. I write notated music — there's a balance between notated music and improvisation that occurs. What is notated is what is written, the improvisation takes place, and the composition contains all of it. That's what I do as a composer. I'm happy that the Pulitzers' views have gotten broader, and seen fit to give me this award. Myself and others who have been working outside classical music — the rest of the artists in the United States, in North America, have been creating art for a long time, and sometimes it doesn't fall under the rubric of so-called classical music. Nonetheless, it is just as creative, and it is important. The Pulitzer Prize has made a major statement, in recognizing my work and others', that they have a bigger picture of creativity. Because that's what we need as a country and as an artistic community, is to have everything recognized. 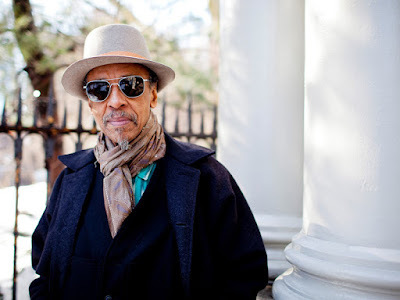 In for a Penny, In for a Pound is the latest installment in saxophonist/ flutist/composer Henry Threadgills ongoing exploration of his singular system for integrating composition with group improvisation. The music for his band Zooid  his main music-making vehicle for the past fourteen years and the longest running band of his illustrious forty plus-year career  is no less than his attempt to completely deconstruct standard jazz form, steering the improvisatory language towards an entirely new system based on preconceived series of intervals. His compositions create a polyphonic platform that encourages each musician to improvise with an ear for counterpoint and, in the process, creating striking new harmonies.